In a ballroom full of singers and fans of all ages, the first Next Generation Junior Quartet Contest took the stage at Gaylord Opryland. The BHS Next Generation Program serves the youth population with two divisions: Junior (18 & younger) and Varsity (25 & younger). The energy in the room was electric: the supporting youth choruses were downright rowdy in support of their classmates crossing the stage. The crowd got especially excited to welcome the first elementary school quartet: Elementary Mix from Quinton, New Jersey. In a true moment of intergenerational exchange, the “seasoned” barbershoppers sang a classic song together while the younger singers watched in awe as hundreds of people harmonized together. This men’s quartet out of Salem, New Jersey, sang “My Ideal” to win by a margin of just one point. Their tuning, dynamics and charisma won over the audience in an instant. 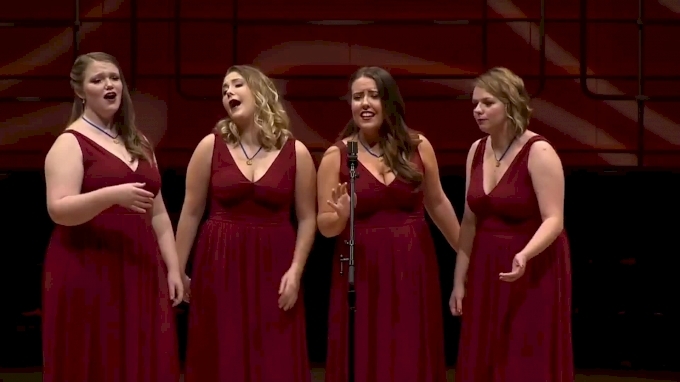 Edging out the second- and third-place tie with a two-point advantage in the singing category, this women’s quartet from Tampa, Florida, is made up of two sets of twins. Singing their signature “When You Wish Upon a Star,” this group of quadruplets out of Milwaukee shined as the only mixed group in the contest. The contest was appropriately bookended with the Next Generation Varsity Champions, Frontier and the Sweet Adelines Rising Stars, Hot Pursuit. Both were favorites of the students with their high energy and humor. Perhaps most encouraging of all was the way the audience erupted into applause and standing ovations for all groups: a great representation of the momentum and support as the Society proudly enters a new era.